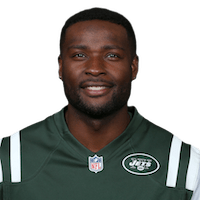 Analysis: Sterling has spent the last two seasons with the Jets, except for one week in Kansas City, and appeared in 16 games (five starts) with 12 receptions for 129 yards during that time. The fifth-year pro projects to serve a depth role behind No. 1 tight end Chris Herndon if he's able to earn a spot on the 53-man roster. Analysis: Sterling suffered his second concussion of the season in the Week 8 loss to the Bears and was on track to miss his second straight game Sunday against the Bills. With the tight end apparently not making much progress through the NFL's five-step concussion protocol, the Jets have opted to shut him down for the season. Sterling's absence for the final seven games should clear the way for Chris Herndon and Jordan Leggett to handle the majority of the snaps at tight end. Analysis: Sterling is dealing with his second concussion of the season and hasn't logged any practice activity since sustaining the head injury Oct. 28 against the Lions. If the tight end fails to make any meaningful progress in his recovery over the next week or so, it's possible that he could be moved to injured reserve for the rest of the season. Analysis: Sterling has missed four games this season due to two concussions. The latest head injury kept him out for Sunday's loss to the Dolphins and is now threatening his status for the Week 10 game against the Saints. He'll likely need to return to practice Thursday or Friday and gain clearance from the NFL's concussion protocol before Sunday if he's to stave off another absence. Analysis: Sterling appears to be stuck in the early stages of the five-step concussion protocol, as he was a non-participant at practice throughout the week after suffering the head injury in last Sunday's loss to the Bears. The 30-year-old missed three games earlier this season with a concussion, so it wouldn't be surprising for him to miss multiple games this time around either. Analysis: Sterling was diagnosed with the concussion after exiting early in the Week 8 loss to the Bears and previously missed three games with a concussion earlier this season. It's unclear where Sterling stands in his recovery from the latest head injury, but with back-to-back absences from practice to begin the week, it's unlikely he'll be available for Sunday's matchup with the Dolphins. 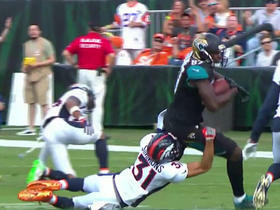 Jacksonville Jaguars quarterback Blake Bortles pass was deflected, but caught by tight end Neal Sterling for 17 yards.